“See this blog post I just wrote, that you’re reading right now? This blog article is proof of the existence of God. Yeah, I know, that sounds crazy. But I’m not asking you to believe anything just yet, until you see the evidence for yourself. All I ask is that you refrain from disbelieving while I show you my proof. It only takes a minute to convey, but it speaks to one of the most important questions of all time. So how is this message proof of the existence of God? This web page you’re reading contains letters, words and sentences. It contains a message that means something. As long as you can read English, you can understand what I’m saying. You can do all kinds of things with this message. You can read it on your computer screen. You can print it, read it out loud to a friend, speak it over the telephone, save it, forward it via email, share it via Facebook; you can post it on some other website if you want to! Regardless of how you copy it or where you send it, the information remains the same. My email contains a message. It contains information in the form of language. The message is independent of the medium it is sent in. Messages are not matter, even though they can be carried by matter (like an USB drive). Messages are immaterial. Information is itself a unique kind of entity. It can be stored and transmitted and copied in many forms, but the meaning still stays the same. Messages can be in English, French, Chinese, they can be in Morse Code; or mating calls of birds; the Internet, radio, television, computer programs, architect blueprints, stone carvings. Every cell in your body contains a message encoded in DNA, representing a complete plan for you. OK, so what does this have to do with God? It’s very simple. Messages, languages, and coded information ONLY come from a mind. A mind that agrees on an alphabet and a meaning of words and sentences. A mind that expresses both desire and intent. Nature can create fascinating patterns – snowflakes, sand dunes, crystals, stalagmites and stalactites, tornadoes, turbulence and cloud formations. But non-living things cannot create language. They *cannot* create codes. Rocks cannot think and they cannot talk. And they cannot create information. It is believed by some that life on planet earth arose accidentally from the ‘primordial soup,’ the early ocean which produced enzymes and eventually RNA, DNA, and primitive cells. DNA is not merely a molecule. Nor is it simply a “pattern.” Yes, it contains chemicals and proteins, but those chemicals are arranged to form an intricate language, in the exact same way that English and Chinese and HTML are languages. DNA has a four-letter alphabet, and structures very similar to words, sentences and paragraphs. With very precise instructions and systems that check for errors and correct them. It is formally and scientifically a code. All codes we know the origin of are designed. I’ve addressed more than 100,000 people, including hostile, skeptical audiences who insist that life arose without the assistance of God. But none of them have ever been able to explain where the information came from. Matter and energy have to come from somewhere. Everyone can agree on that. But information has to come from somewhere, too! I don’t believe in the religious dogma of God and this is not, in any way, describing ‘an old man with white beard sitting on a cloud’. It’s rather pointing a fact that’s been hiding right under our noses. There is a code in our DNA that holds a message. You are the living translation of this message. This code has to come from some mind. 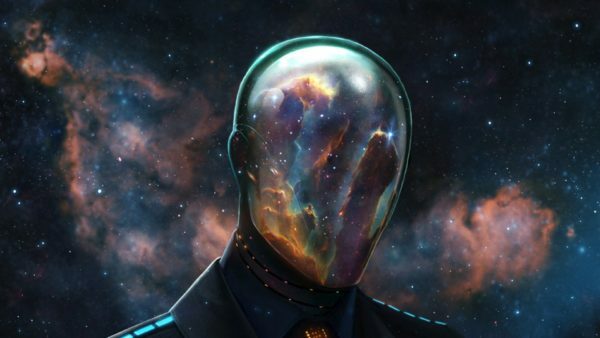 Maybe The Universe itself is an entity and has its own mind which we spawn from. Maybe our code is a language of this Universal mind that created the fundamental forces, the stars, the galaxies, the atoms and Earth.